Frederick III (c. 1020 – 1033) was the Count of Bar and Duke of Upper Lorraine from the death of his father, Frederick II, in 1026 or 1027 to his own death. His mother was Matilda of Swabia, daughter of Herman II, Duke of Swabia. His father had been co-duke since 1019 and his grandfather, Thierry I, continued to reign until his own death in 1027 or 1028. His reign is completely obscure. Even his regent is unknown. He died young and his county of Bar passed to his sister Sophie while Lorraine was given to Gothelo I, Duke of Lower Lorraine. This biographical article of a European noble is a stub. You can help Wikipedia by expanding it. Conrad II, also known as Conrad the Elder and Conrad the Salic, was Emperor of the Holy Roman Empire from 1027 until his death in 1039. The founder of the Salian dynasty of emperors, Conrad also served as King of Germany from 1024, King of Italy from 1026, and King of Burgundy from 1033. The Duchy of Lorraine, originally Upper Lorraine, was a duchy now included in the larger present-day region of Lorraine in northeastern France. Its capital was Nancy. Frederick I was the duke of Lorraine from 1205 to his death. He was the second son of Matthias I and Bertha, daughter of Frederick II, Duke of Swabia. He succeeded his brother, Simon II, who had already given him the county of Bitche in 1176 and had recognised him over the northern, germanophone half of Lorraine by the Treaty of Ribemont of 1179. Judith had wanted him to succeed to all their father's inheritance, but a three-year civil war only secured him Bitche and a half-portion. Frederick II was the duke of Lorraine from 7 April 1206 to his death, son of Frederick I and Ludmilla, daughter of Mieszko III the Old, monarch of Poland from the Piast Dynasty. Frederick III was the Duke of Lorraine from 1251 to his death. He was the only son and successor of Matthias II and Catherine of Limburg. Frederick II, son of Thierry I of the House of Ardennes and Richilde von Blieskastel, daughter of Folmar III, Count in Bliesgau; was the count of Bar and duke of Lorraine, co-reigning with his father from 1019. The Duchy of Swabia was one of the five stem duchies of the medieval German kingdom. It arose in the 10th century in the southwestern area that had been settled by Alemanni tribes in Late Antiquity. 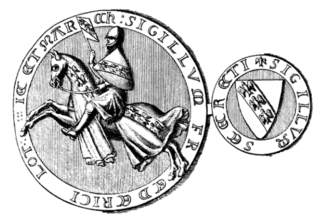 Waleran III was initially lord of Montjoie, then count of Luxembourg from 1214. He became count of Arlon and duke of Limburg on his father's death in 1221. He was the son of Henry III of Limburg and Sophia of Saarbrücken. Judith of Bavaria, Duchess of Swabia was a Duchess of Swabia by marriage to Frederick II, Duke of Swabia. She was the mother of Frederick I, Holy Roman Emperor, known to history as "Barbarossa". Matilda of Swabia, a member of the Conradine dynasty, was Duchess of Carinthia by her first marriage with Duke Conrad I and Duchess of Upper Lorraine by her second marriage to Duke Frederick II. She played an active role in promoting her son, Duke Conrad the Younger, as a candidate for the German throne in 1024 and to this end corresponded with King Mieszko II of Poland.